You do not have to look up from small group instruction to know what is happening. The buzz around the room has become energized, and hushed tones excitedly murmur…. I see them coming. It’s Tuesday, remember! Look! Here they are. Where’s mine? Oh, there she is! It is time for our “tall teachers” and Michelle Myers, Ph.D. from the University of South Carolina Elementary Education, M.A.T. program to come work with our third grade “small teachers”. 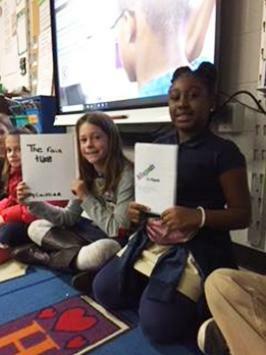 Every Tuesday, the University of South Carolina Elementary Education majors experience their ELA curriculum class at Meadowfield Elementary School. The school provides a classroom space for the university course to meet and a classroom of elementary students for using the strategies learned from the professor and the textbooks. After hearing the theory from the university course, the “tall teachers” (as they are affectionately known) head to room 409 to implement the strategies discussed with Meadowfield students. The MAT students turn theory into practice in a third grade classroom. 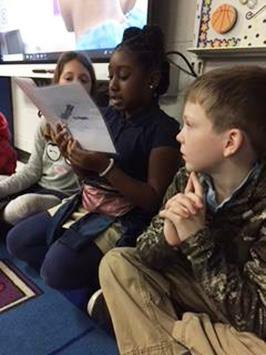 The experience gives both third grade students and the university students the opportunity to learn from and with each other. Some days the university students will observe Michele or Sara teaching a mini lesson. The professor and classroom teacher will model effective teaching strategies for the university students. On other days, the “tall teachers” work with their “small teachers” on reading and writing strategies. The “tall teachers” then return to their university classroom setting to debrief what they heard, observed and know based on the strategy. Some days you can find tall teachers working with their small teachers in partnerships/small groups all around the school. One project of particular interest: They created books together. Third graders were so excited to share their work with the rest of the class. Having “tall teachers” allowed several author’s circles to provide validation to the weeks they spent writing and illustrating their books. There is no better way to prepare university students for entering the teaching profession than working alongside students in an authentic setting. The opportunity affords pre-service teachers to experiment with research-based instructional strategies from their university class in a real time classroom. This is Professional Development School partnerships at its best!